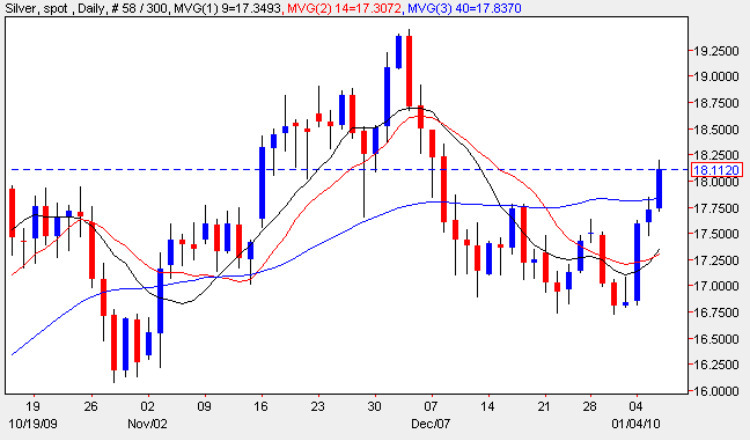 Following the weak end to 2009, spot silver prices have started the new decade with a strong recovery, sparked by Monday’s wide spread up candle which breached both the 9 and 14 day moving averages, and was subsequently followed up with both Tuesday and Wednesday’s candles adding further to the positive sentiment, with today’s candle breaching the 40 day moving average and the psychological $18 per ounce level. With the 9 day moving average now crossing above the 14 day average this is adding further to the bullish sentiment as we now approach potential resistance in the $18.50, with a break and hold above this level signalling the possibility of a further move higher possibly to retest the $19.25 per ounce region once again. With today’s price action have cleared the resistance in the $17.75 price level, this may well provide the solid platform needed for silver to break higher and recover the lost ground of December. Longer term the key level remains the $19.25 per ounce level, and should this be breached in due course then we could see a breakout for spot silver, much the same as seen for gold, as the commodity breaks into new high ground above $20 per ounce and beyond later in the year.